There are occasions where this error can occur in AutoEntry that invoices cannot be published through to AccountsIQ. To correct this a background fix needs to be applied by AccountsIQ support. 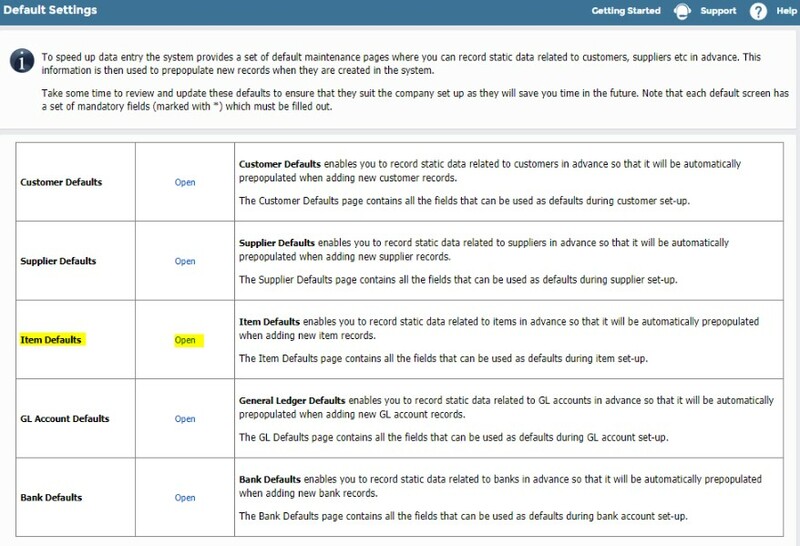 Take a screenshot of the Default Settings page in the relevant AccountsIQ company showing how the Item Defaults option (highlighted above) is not present. Email this screenshot to AccountsIQ support noting how the Item Defaults option is not available - also note what Sales and Purchase Accounts you'd like them to assign as 'defaults' for new Items (otherwise just ask for any available GL Account and you can update them yourself later). Once fixed, go to the integrations page and re-sync the data with AccountsIQ - you should then be able to publish the invoices again (note that the original warnings remain beside the invoices until they are published).